New Evidence Of A Housing Bubble? The home price affordability index dropped below a long-term trend line, once again igniting fears of a housing bubble. But some experts say the worries are being blown out of proportion. The latest reading of the index marked the lowest level of home affordability since July 2009 and the fourth month that the index has come in below trend. The index measures the household income needed to qualify for a traditional mortgage for a median-priced single-family home. Higher mortgage rates and home prices are causing affordability to drop. Home prices have surged 14.4% compared to a year ago, and mortgage rates were recently at their highest averages since February 2012. Wages are rising — but not as fast as home prices. Economists suggest that when the index falls below trend for at least three months, it may be an indication of the beginning of a housing bubble. Analysts are quick to point to the beginning of 2004, when home affordability fell below its long-term trend. Some say that marked the beginning of the last housing bubble. 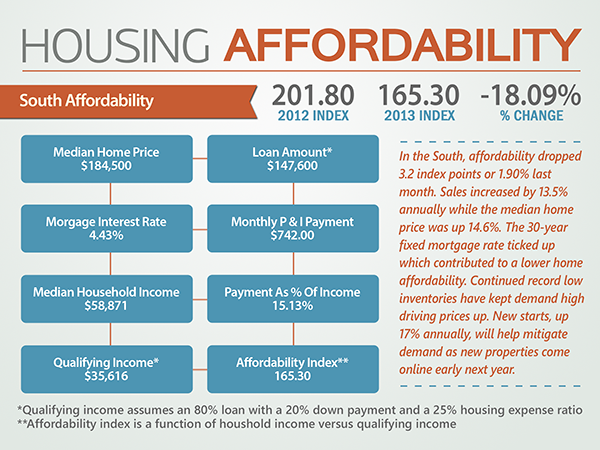 Housing affordability stayed below the long-term trend until December 2008. Housing affordability this year dropped below the long-term trend in April and has stayed there through last month. But even signs of a housing bubble don’t mean home prices are doomed to crash. Affordability could likely strengthen in the coming months as prices have decreased from a month ago and most likely reached their seasonal peak for the year. Even with rates increasing, certain metro areas have healthy inventory levels, and consumers can still look to purchase before those historically low rates are a thing of the past.